MONSTER SHOES - Jack's new shoes are out of control! How can he tame them? A funny chapter book for younger readers. Jack loves his scruffy, squishy, comfortable old trainers. But Mum won't let him wear them to school. Instead, she takes him to buy a new pair. And at a shop signed MONSTER SHOE SALE, she sees just the thing. They're Monster Shoes! And soon they're out of control! They make Jack's feet do all sorts of dreadful things. How can Jack tame his Monster Shoes? Find out in this easy chapter book for beginner readers, with delightful illustrations by Georgien Overwater: now reissued in paperback and as an ebook. 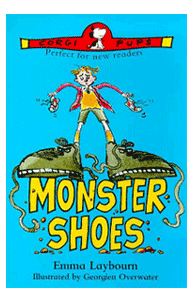 MONSTER SHOES was shortlisted for the Big 3 Book Award. Want to try a free story?